Squibs And Crackers: Flowers, The Kind That Don't Die! Flowers, The Kind That Don't Die! There was a little teacher appreciation action going on at Ethan's school last week. 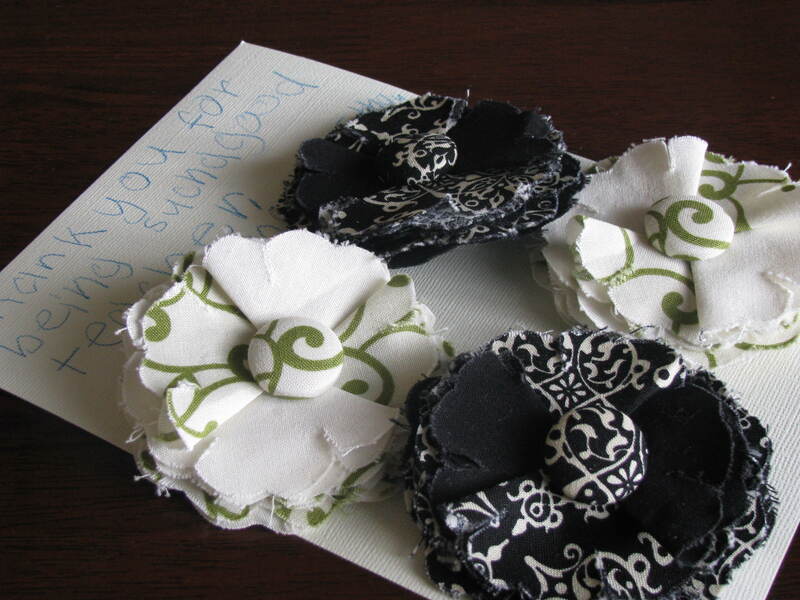 I made her flower pins using these directions. Ethan has reported that his teacher has worn them several times, including in her hair. Yeah! I went on a cooking strike because this mama is tired of uneaten dinners, wasted food, and "I don't like that!" It is now Day 4 of my strike and no one has complained. They simply pour themselves a bowl of cold cereal. Their diet consists of cold cereal for breakfast, peanut butter sandwiches for lunch, and cold cereal for dinner. I am beginning to break into a cold sweat whenever I think of the lack of vegetables and fruit. Ridiculous! Although they ate very little of my healthy meals, at least I had the knowledge that it was offered to them. Tonight, I surrender and veggies will be served. You checked out my guest post...you sweetie you. So made adorable flower pins for Ethan's teacher, but what did you do for yourself for teacher appreciation, huh? I am so glad you didn't make me any of these flower pins. Gift cards, lady, GIFT CARDS! A four day strike? What do you think would happen if you just never, ever cooked again? And....ummm.....it is May 22nd. That means you have nine days to visit me.